To recreate this myth each guest chose a small stone to crush. Since crushing stones can be quite messy, this is best done in nature, which also holds the significance of letting Mother Earth take the broken pieces to transform them. Our event took place on the nearby banks of the Hudson River where there are these wonderful, huge pieces of granite lining the sides of the river. I found a flat one that could be used as our altar/breaking surface. Another large but easily handled stone was used as the mallet to break our patience stones. I tested all this out in advance for safety concerns. The directions were called in as we sat in a circle on blankets next to the river. I then related the Persian myth of the patience stone and asked each person to choose a stone. "First thank the stone for being of service to you and offering itself up for this ritual. And remember that you will be giving it back to Mother Earth so that it can be transformed , much like animal waste becoming fertilizer for new life. “Next ask your stone to please take that which holds you back from living in freedom: all your worries and fears, complaints and misfortunes. Literally talk to it. Give everything to the stone, anything you would like to release. We'll have five minutes to do this. I'll ring the bell when it's time to come back." Participants walked around the area with their stones. Some cupped it in their hands held up to their mouths like they were sharing a secret with a friend; others just held it in their hands by their side and walked contemplatively, softly murmuring. After I ran the bell we gathered around the stone altar by the edge of the river where I demonstrated how to crush the stone between the two larger ones. "Your stone is now full of your burdens that you are ready to release. When you feel compelled, one at a time, please come forward and break your stone and truly let go of all it carries for you. As you are watching others make their release, hold the space for them that they really can let go and surrender these burdens, so that which doesn’t serve them is being taken back to nature and transformed." After everyone crushed his patience stone we returned to our circle and each chose a seashell. "Take your shell and hold it to one ear and listen. (Pause) Do you hear the stillness and calm? Are the voices of worry and fear, those constantly reminding you of your troubles, quiet? 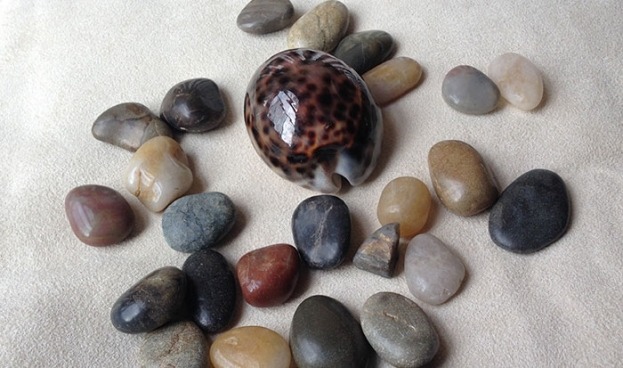 Keep this shell as a reminder of how this clearness feels." The directions were closed. Our gathering took place during a lovely afternoon so we ended our ritual with a picnic. It began with a lively recounting of the breaking of the stones. We all agreed it was interesting to see the differences in how each stone broke. Some disintegrated on the first try, while others only after multiple times. Some were obliterated into dust while some stayed a bit chunky, which a couple people decided to smash further. Those whose stones didn't break so easily were able to laugh about it but also saw it as an example of how they have a difficult time letting go of things. Diving deeper they also saw that it can be done with intention and a bit of practice and persistence. Everyone also agreed that the actual physical effort was very cathartic. Finally, we shared our surprise about how quiet our minds actually were when listening to the shell. I know I've used my shell many times since then as a reminder of those still quiet moments when I can let go of my fears and worries. I find this very interesting. In Judaism we have a ritual during Rosh Hashanah known as tashlisch. Symbolically, we cast our sins into a moving body of water. Personally, I see this as a way of getting rid of the things that have weighed me during the past year, and starting over New. Much like telling a rock or pebble your burdens and then crushing it, a new start can be made. I love this blog/article! I am so blessed to have found it. It was like at the perfect timing in my life. This is a very insightful and positive piece that you have created! Does certain stones have better or stronger effects than others? I am most certainly going to be subscribing! Thank you for posting this, looking forward to future posts! It reminds me of one I made on my website, Weindigocom.wordpress.com. Namaste! Have a perfect day!